Chocolate truffles are rich and creamy mouthfuls of soft chocolate. 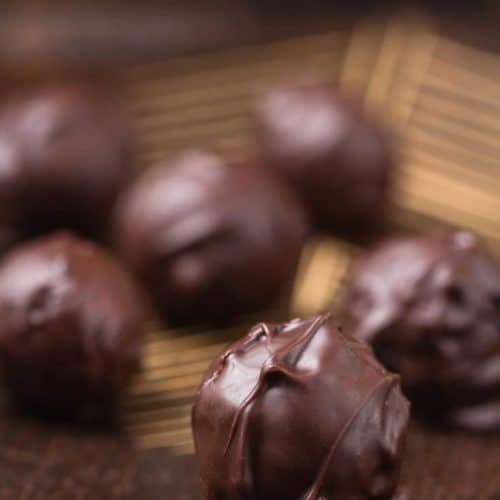 Chocolate truffles in the stores, if you can find them often are very expensive, but with a little time and patience, you will be making sumptuous chocolate truffles for the people you love the most. Years ago, I used to make lots of chocolates for the holidays. I had a large family, and dipping things into chocolate, or creating chocolate candies, was something I loved to do for everyone. I would make around 50 pounds of chocolate creations Thanksgiving weekend. While others were out shopping, I would be at home making candies for about three days straight. By the time this candy making festivity was over, my back ached from constantly bending over, and I couldn’t handle the sweet smell of chocolate any longer. 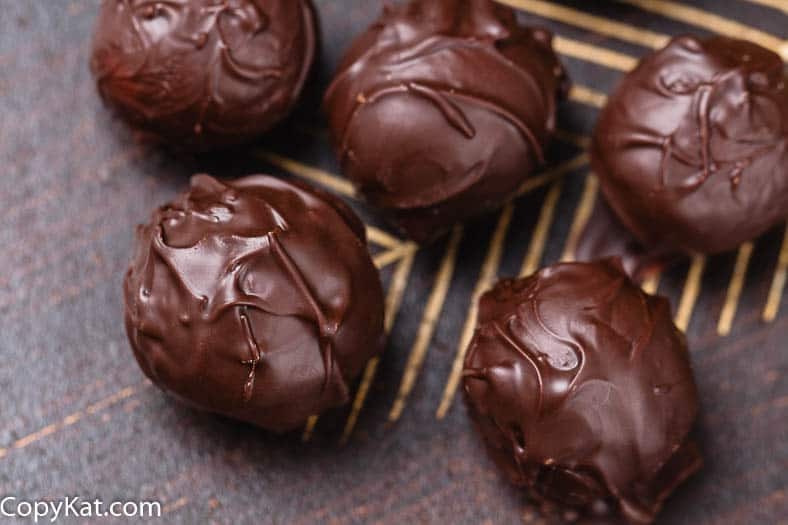 Making homemade chocolate truffles is one of my favorite candies to make. You can flavor truffles anyway you like, or not at all. My recipe includes an almond liqueur, but you can add any flavor you like. I have made truffles with coffee flavored liqueur, hazelnut liqueur, dark rum, and orange liqueur. So when you are making your truffles, you can make them any way you like. My truffles are covered in chocolate, but you can simply dust the truffles with cocoa powder. Either way you finish your truffles, they will be a real delight. For my recipe, I am using chocolate in 10-ounce increments. After making the New York Times Best Chocolate Chip Cookie Ever, I realized that you can indeed by better quality chocolate in the grocery store if you take time to look. Now, I personally love dark chocolate, you may not. When I make truffles, I typically make dark chocolate truffles. So when I make these, I buy the chocolate chips with a high amount of cacao (how much chocolate liqueur is contained). I have also made these same truffles with Valrhona or Callebaut, and they come out very well. Most of us can’t find these brands at our local grocery stores, thanks to the Internet and online ordering, everything is just a click of the mouse away. Candyland Crafts – need candy making supplies? I have ordered from them before. 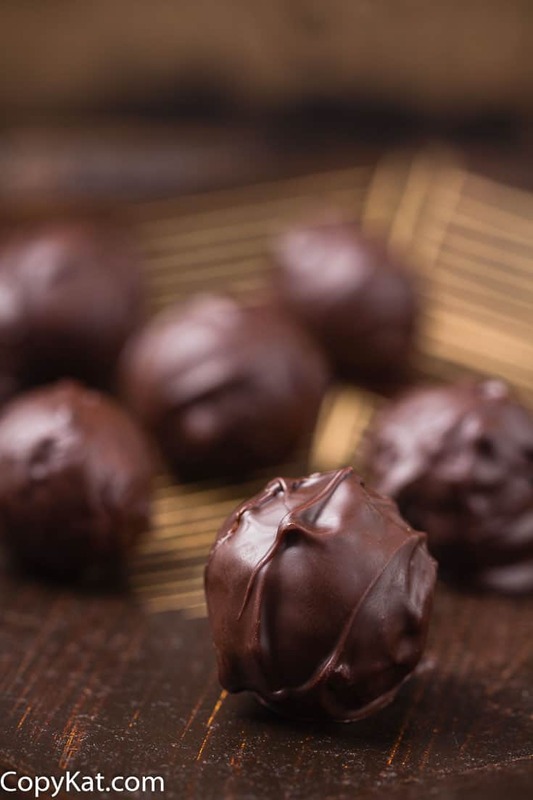 You will be surprised at how easy it is to make chocolate truffles. To make the ganache, bring heavy cream, and vanilla to almost a boil, pour the warm cream mixture over the chocolate. Whisk the chocolate and cream, until it is smooth and the chocolate is melted. When the mixture is smooth and creamy, with no more chunks of chocolate in mixture add in liqueur flavor that you desire. Cover the bowl with plastic wrap and place in the refrigerator for a couple of hours. You will want to chill the mixture so it will be easy to make the individual truffles, until the mixture hardens it will be too soft to make the truffles. After about 3 to 4 hours, or even overnight, remove the unformed truffles from the refrigerator. Use a cookie scoop or a tablespoon to scoop out the truffle. Place truffle onto a cookie sheet that has been covered with either wax paper or parchment paper. Once all of the chocolate has been scooped out into individual pieces you may need to shape the truffles by rolling them into small balls. Place cookie sheet into the refrigerator while you make the ganache. Make the chocolate coating for the outside of the truffle by melting two tablespoons of butter and pouring this over 10 ounces of chocolate. You may need to gently heat the chocolate in the microwave, or over a double boiler. Once the chocolate has been melted, you can begin to dip the truffles into the chocolate. Dip the truffle into the melted chocolate, roll the truffle around into the chocolate until it is fully coated, using a fork lift the truffle out of the chocolate and gently tap the fork on the edge of the bowl to remove excess chocolate. Place the chocolate coated truffle onto parchment paper, and let the chocolate harden. Before the chocolate sets completely you may choose to dust your chocolate with something extra. Chopped nuts or even coarse sea salt are perfect additions. If you have never tried sea salt on chocolate, if your palate is a little more daring, you may find this a new flavor that you will love. Let your chocolates fully set and become hard before moving them into a storage container. Hey, I really don’t like alcohol, but I’m guessing the alcoholic content sort of boils out during the truffle-making process? If not, do you suppose imitation extracts would work as well? (Almond extract, coconut extract, peppermint extract, etc. etc.) Extracts are the bomb. I make truffles often, including this recipe. Be careful with immitation flavors as they will taste artificial. I use oil extracts instead – only a few drops gives the entire batch flavor. I also make pomegranite syrup (juice reduction with sugar), or leave the cream out of the genache and add peanut butter with a toffee oil extract, add toffee pieces to genache, add finely cut coconut, add cream cheese instead of cream and then add a bit of allspice, nutmeg and cinnamon, etc. If made without cream, they last a good 3 weeks unrefrigerated. These look wonderful! I can’t wait to make them for Christmas gifts this coming year!I think dark chocolate is the only way to go! It’s healthier and taste the best! But my husband would disagree as would many of you out there! Thank you for posting this one!